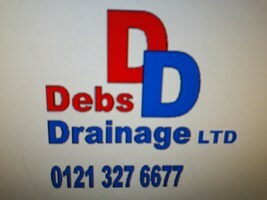 Debs Drainage Ltd - Drain/Sewer Clearance based in Nechells, West Midlands. YOU'VE TRIED THE REST NOW LETS PROVE DEBS DRAINAGE TO BE THE BEST; YOU WILL NOT BE DISAPPOINTED. ESTABLISHED SINCE 2011 9 YEARS TRADING. NO DIG PIPELINING/ PATCH LINING REPAIR WORKS. THIS IS THE WAY TO GO TO PREVENT LARGE EXCAVATIONS GIVING YOU PEACE OF MIND. BLOCKED DRAINS/ MANHOLES CLEARED. CAMERA SURVEY'S UNDERTAKEN. BLOCKED TOILETS/ SINKS AND BATHS CLEARED. STACKS CLEARED, GUTTERING CLEANED. ACCO CHANNELLING INSTALLED BOTH DOMESTIC AND COMMERCIAL PROPERTIES. HIGH PRESSURE WATER JETTING TO BLOCKED DRAINS/ GULLIES/ MANHOLES. MAINTENANCE TO SCHOOLS DRAINAGE UNDERTAKEN. 30 DAY ACCOUNT SET UP. NO CALL OUT CHARGE; JETTING. CAMERA SUREVEY'S. TRACING. BROKEN MANHOLE COVERS WORKS UNDERTAKEN. EXCAVATION WORKS CARRIED OUT. WE COVER ALL AREAS OF THE WEST MIDLANDS INCLUDING DERBYSHIRE. STOKE ON TRENT. COVENTRY, LECEISTERSHIRE. OXFORDSHIRE, ALL AREAS WITHIN 1HR TO 1.5 HRS TRAVELLING FROM BIRMINGHAM COVERED. PAYMENT BY CASH/ CHEQUE OR BAC'S TRANSFER. HOURS OF BUSINESS; MONDAY TO FRIDAY 8.30AM TO 5.OOPM. PLEASE CALL THE OFFICE ON 0121 327 6677 FOR ANY FURTHER INFORMATION YOU MAY REQUIRE. PLEASE CALL DEBBIE ON THE OFFICE NUMBER, WHERE I WILL BE GLADLY TO ANSWER ANY QUESTIONS. WE ARE A SMALL COMPANY WE PRIDE OURSELVES ON OUR WORK, CUSTOMER RELATIONS, TIME KEEPING AND PERSONAL TOUCH TO OUR CUSTOMERS. PLEASE READ THE REVIEWS FROM CUSTOMERS WE HAVE AND CARRY OUT WORKS FOR.